When the most wonderful time of the year has come, people tend to set aside all the things that kept them busy during the first 11 months. The focus is now shifted to decorating the home to make it ready for the Christmas season. The usual decorations include an eye-catching Christmas tree, lanterns, blinking lights, candles, garlands, and mistletoes. 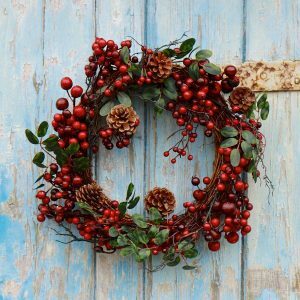 With all these things enumerated, it is surprising that there is still one essential décor we can’t leave without; and that is a Christmas wreath. A Christmas wreath is a ring-shaped adornment made of plants, flowers, and other colorful add-ons. It comes in different sizes, colors and designs. Some wreaths are also manufactured fresh with the use of live plants while most are artificially-made. They are mostly hanged in doors, stairways, and walls. But in truth, it can be placed in any part of the house and it would still complement the other decors. It is so easy to use that even the kids can take part in the decoration process. To make this Holiday season even more memorable, we have compiled a list of things you should consider in choosing your Christmas wreath. First and foremost, decide if you want live wreaths and if you are ready to do the maintenance it requires. Fresh wreaths needs special care, the leaves and flowers will soon wither and would require replacement. Their scent however is their winning feature. Always keep an eye on your wreath because you wouldn’t want some dead plants hanging on your wall. On the other hand, if you are the very busy type, artificial wreaths will be ideal for you. Besides having little to no maintenance, they are cheaper and more durable than fresh wreaths. They can be left unattendedfor long periods and can be reused every year. Once you’ve decided whether to buy fresh or artificial luxury Christmas wreath, get hold of the wreath you are eyeing and meticulously observe it. Ensure that it is of good quality. See to it that its weight is appropriate to its size. Having a solid structure means that the wreath was assembled with no hidden gaps which could be the cause of easy disfigure. It must be fully stuffed and constructed sturdily. The Christmas season is a long celebration, and you would need a decoration that will survive. Embellishments would include the ribbons, pines, cones, and holly attached on top or at the bottomof the wreath. The use of waterproof embellishments will ensure that they will stand bad weather. Be sure they are attached properly to the wreath to maintain its order and beauty. 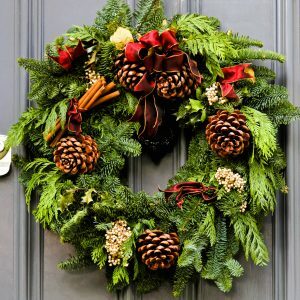 Your choice on Christmas wreaths is all about style – yours! Choose a wreath in accordance to your home’s theme or colour scheme. You need to settle on complimenting colours so as not to confuse or distract your holiday guests. Consider your home’s overall tone and from there, decide your theme or paint the entire house altogether. The most common hues are green and red or red and gold. To create a winter wonderland theme for this year, opt for blue and silver wreaths while the rest of your decorations should be in those colours too. This sophisticated look is sure to wow everyone who enters your house. Wreaths come in varied sizes, and people can get excited with their shopping that they tend to just get whatever is available. 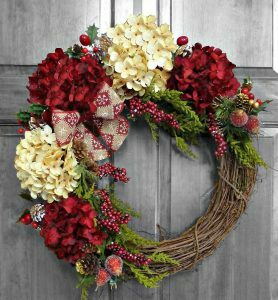 Decide where you are to place the wreath and go big or small depending on that space. These days, there are so many stores offering Christmas wreaths. To narrow down your search without wasting time, effort, and car fuel driving around these shops, tries to buy Christmas wreath online. A lot of stores with online pages provide great pictures, design, shipping options, and many more. You can easily compare each shop as well as the many products without leaving your home. Shorten your shopping list by taking advantage of these online shops. Christmas is the time when many people come to our house to visit so we must ensure that it’s in its best condition. We are very lucky that a lot of decorations are now readily available for our disposal. By now, we hope you have learned enough tips on how to choose the perfect Christmas wreath. Choose wisely and diligently. Follow each tip and you are sure to make this season much more enjoyable for everyone.